Even though the house was not ready, we decided to do a drive by and hang around nearby. B had been running a fever for a couple days so we had to stop and get more meds for poor sweetie. With an hour left to kill we stopped for a brew at The Blue Pine on 14th Street. They had tasty beer, heirloom popcorn, and some room for kiddos to meander. Finally 3 pm arrived and the house was ready! We had just brought all our stuff in when Tim and Liz arrived. Hugs and chatter filled the house as we settled in and got to drinking and catching up. 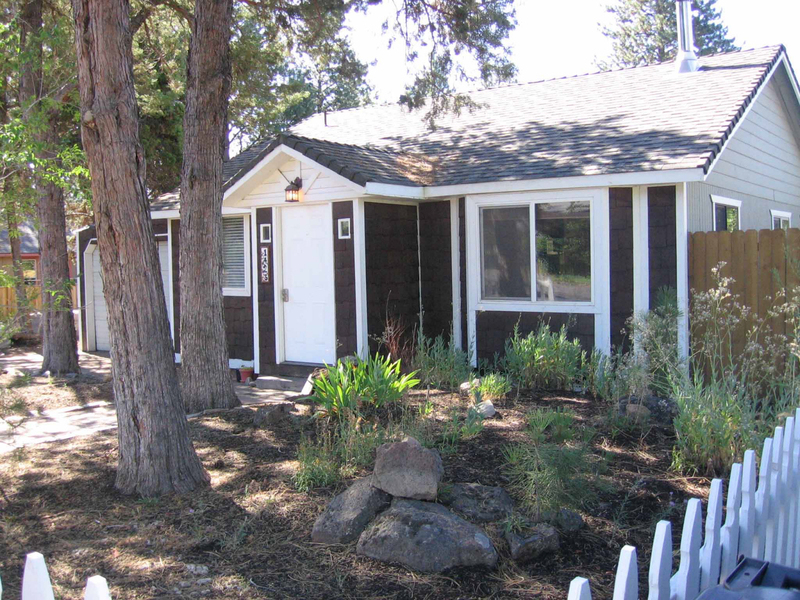 The rental house is great, Cinder Cone Cottage on the Westside of Bend has 2 bedrooms (one with a loft), one bath, a nice kitchen and a patio with a hot tub. Its very kid friendly and has serves us well. We’ve been walking all over and enjoying the afternoons napping and recharging. B had another battle with a fever so T&L biked to the market to pick up some fish for grilling. We finally got the kids down and feasted on the back porch, talking late into the night. We woke and feasted on a scramble of left over salmon and halibut, zucchini, potatoes and other yummy bits then packed up the kids and gear for a bike ride. We ended up riding on some paved bike trails that were a bit too hilly and not very pretty so we took a turn into this new neighborhood, Northwest Crossing. Apparently its a pretty green development… the houses were very cool, lots of modern spins on the craftsman concept. The best thing was the playground! Lots of cool climbing and spinning things, we had a nice break there, then continues on home for siesta time. After naps we geared up again for an adventure out. The original goal was 10 Barrel Brewing but the wait was 45 minutes and the kids were restless so we headed down the street to Parrilla Grill for some tasty wraps and beers. Then we shopped for rations: Cup cakes, aged New York steaks, fresh produce for Justin’s birthday dinner. After we stopped in again at 10 Barrel for another pint. Back at the ranch we fed, bathed, and put the kids to bed (kinda- N watched movies for a while) and we all made parts of the dinner while watching the Timbers game on my Chromebook (they won). Dinner was AMAZING! Justin is a grill master.